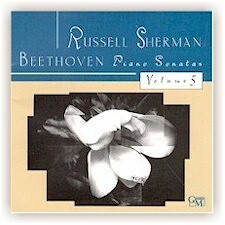 The final volume of five double-CD sets in which master pianist Russell Sherman records all of the Beethoven Piano Sonatas. His vision of the Sonatas is boldly expressive — the first four volumes (GM2050 , GM2053, GM2057 and GM2067) have received widespread critical acclaim, including Stereo Review’s “Pick of the Month,” five-star reviews, and numerous mentions on annual Top Ten lists. Sherman began his studies at the age of six, and, by the age of eleven, was studying with the renowned Edward Steuermann, friend of Ferruccio Busoni and Arnold Schoenberg. A child prodigy from New York, Sherman graduated from Columbia University in Humanities at the age of fifteen and soon thereafter played solo piano with Leonard Bernstein’s orchestra. Featured on National Public Radio, he has earned a reputation over the years as an interpreter of remarkable insight and imagination both in standard piano repertory and in his vigorous advocacy of contemporary music. Mr Sherman is author of the acclaimed Piano Pieces and has been faculty at Harvard University and the New England Conservatory. Also available for downloads on Amazon as well as Apple Music, Spotify, Rhapsody, eMusic and other digital sites.